SouthCarolinaPilot wrote: 3. For simplicity's sake in South Carolina there are three major regions: Upstate, Midlands, and Lowcountry. There's other areas like the Pee Dee and Grand Strand, but I will keep it simple. It's easier to refer to things as upstate and downstate since "Northern South Carolina" is kind of confusing. Also, with Interstate 26 being the major thoroughfare connecting the Greenville-Spartanburg, Columbia, and Charleston areas, it is an East-West highway that runs slightly more North-South in a way (everything here is Northwest to Southeast). I guess that upstate just makes a lot more sense to people here. Honestly, it's weird to think that Charlotte is directly north of me and Atlanta is directly West. This is the great insight that I come to PN for! Hey man, whatever works for the South Carolinians is fine with me. At least it's not as bad as when I lived in Austria. Upper Austria was in the west and Lower Austria was in the east... they used elevation to determine the Upper/Lower distinction, not cardinal directions. Same reason why Low German is spoken in the north of Germany, Middle German in the middle, and High German in the south. SO CONFUSING!!! NoPoNeighbor wrote: After strong arming the WCC to create an unbalanced schedule in order to avoid playing two RPI-drag games against weak conference opponents, Gonzaga has announced the opponents it will be playing this year instead of our Pilots and Pepperdine: North Dakota Stake, CSU Bakersfield, and North Alabama. NDSU is usually okay, but Bakersfield is no better/worse than one of the games they dropped. Does North Alabama count in the RPI in their first season as a D1 school? Not sure of the rules on that. Fun fact, .edu domains are only for American schools. We just use .ca addresses for our schools here so Canada College can have it without causing yet another international incident between our two fine countries! Ah, yes. I’d forgotten about that. But that’s only been true since 2001, and you are now only allowed one .edu account, so the uofport.edu account UP used originally is now dead. Some foreign schools retain their original .edu URLs as well as their current ones. Oxford.edu, for instance, redirects directly to the ox.ac.uk site they currently use. I don’t know if any Canadian schools kept theirs. Doesn’t always work. Cambridge.edu gets you to a junior college in Yuba City. The university of Port Harcourt Nigeria now uses uniport.edu.ng . PilotNut wrote: This is the great insight that I come to PN for! What can I say? This is what the F5 season offseason is for. Frankly, I am not too concerned with the schedule this year. I just want to see this team take a big leap forward in the win column and maybe make any post season tournament. I imagine all of the newcomers are already on campus, practicing, and taking classes? I don't know if it was shared here or not, but Alec Wintering participated in the Charlotte Hornets summer league mini camp. He did not make their Summer League roster, unfortunately. SouthCarolinaPilot wrote: I imagine all of the newcomers are already on campus, practicing, and taking classes? Everyone is on campus except Ty Glover, and it was known when he signed that he'd have to finish JUCO summer classes before enrolling at UP. Well, first of all, it would appear you haven't been reading all the posts, Mesa, 'cause the preseason schedule starts in October with an exhibition game against Antelope Valley, coached by UP alum Darwin Cook, on October 27. I still haven't been able to determine the other non-D1 opponent UP will be playing this coming season besides Multnomah,, but it looks like the rest of the schedule is coming together. This is totally unofficial, and the dates could vary slightly, but I'm confident the list of teams is correct with the possible exception of Arkansas Pine Bluff in Honolulu. Who is currently an assistant basketball coach for the women's team at Pepperdine. Here is a link to his moment of fame. The home matchup is much more important, but if they were to ever play a game out here against USC Upstate, I would definitely be both excited and in attendance. I am definitely going to drive to the men's soccer game at Coastal. After watching that clip a few years ago, I asked a number of referees if they would have changed their call, and 100% said they would not change it without video replay evidence, and most agreed that players are not in a good position to see who last touched the ball. But still, a good ad for sportsmanship. Wil the PSU game be in the new arena? I remember,reading in February it was supposed to be finished in April, but nothing since. Geezaldinho wrote: Wil the PSU game be in the new arena? I remember reading in February it was supposed to be finished in April, but nothing since. 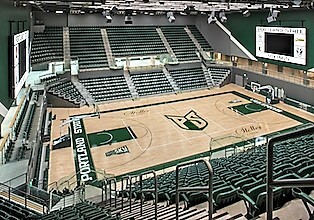 Yes the game against the Vikings on December 5th will be in the new 3,000 seat Viking Pavilion, dedicated April 9th. The PSU athletic director said the new pavilion has really made a difference in the quality of athlete now coming to PSU (she didn't say anything about the quality of the student-athlete being attracted). I visited the arena recently, and I gotta say it's a steep climb to the upper seats, kind of like the old Kingdome, but there are railings. I was recently at a barbeque attended by a few of the players, and saw this great looking "new guy" with a very impressive physical presence and physique. Turns out he wasn't a new guy at all, but our own Tahirou Diabate ("D"). Last season at 210lbs D often had to go up against opponents who were much bigger if not any quicker, but now D tells me he's at 245lbs and quicker too! Too early to see how the new lineup comes together, but I'd say there's a good chance D will play the 5 on offense and a 4/5 on defense interchanging with Theo (Akwuba) and Jacob (Tryon). Congrats to University of Portland freshman 6’11 Theo Akwuba on being selected as a top 100 player for 2018 class. He avg a triple double as a senior. He has a bright future!! Philipp Hartwich signed with Huesca in Spain's LEB ORO (second division) today. Huesca is about a 3 hour drive to the northwest of Barcelona in the low lying mountains in Northeast Spain. If I recall correctly, Huesca is the first team that UP alum Donald Wilson signed with back in 2006, and he loved the city and its people. After finishing second-to-last in the WCC last season, Portland could find themselves in a worse spot in 2018-19. While the Pilots keep six of their top eight scorers, the lack of any significant upgrade means their season will rely heavily on the development of their young core. Although only a 5.6 points-per-game scorer, Philipp Hartwich may be one of the biggest losses in the WCC. Without Hartwich, who contributed 24% of the team’s rebounds, Portland will most likely remain the worst rebounding team in the conference. Hartwich was also perhaps the best interior defender in the conference, recording 2.3 blocks in WCC play. All is not lost for the Pilots, as Head Coach Terry Porter returns a young core with pretty good talent. Guard play will be key to the Pilots’ success, led by Marcus Shaver, Josh McSwiggan and the Porter brothers. JoJo Walker will be a big factor off the bench, and could be one of the best three-point shooters in the conference. The frontcourt is a big question mark, with Tahirou Diabate carrying most of the load. Joining Diabate will be freshmen Hugh Hogland, Josh Phillips and Theo Aukland, as well as JUCO transfers Jacob Tryon and Tymoryae Glover. If the Pilots get production out of their frontcourt, they could potentially surprise the WCC, but for now it appears that they will be a backcourt reliant team. This Pilots team has a lot of potential, but Terry Porter will need to convert that talent into wins, which could be difficult without a strong frontcourt. This may not be a do or die season for Porter, but a third straight bottom-three finish for Portland may warm his seat a bit more. My WCC rankings heading into this season. Well that’s disheartening, but it’s also probably pretty accurate.…If the frontcourt can’t produce, the Pilots will be in big trouble this coming season. In terms of numbers, the Pilots have not been this deep in the frontcourt in a long time. And a relatively soft preseason schedule (compared to last year) should give Diabate, Hogland, Tryon, Akwuba, and possibly Phillips, a chance to adjust to D1 basketball before the WCC season begins on January 3rd. If they can’t adjust and develop, then yes, last place could be a reality. The writer seems to give Phil a lot of credit for any success the Pilots may have had last year, but IMO this new group should exceed Phil’s numbers. Overlooked by the writer was Crisshawn Clark. A healthy Clark will be an instant upgrade in leadership and backcourt skill on both sides of the ball. 10th? Damn, I want Hoop Scoop to come up with WCC preseason rankings. Based on his improvement over the course of the season and performances late in conference play I'm convinced Diabate will be able to produce... If he can stay out of foul trouble. I've seen the predictions of four sportswriters, and three predict UP will finish 10th in the WCC, while the lone "optimist" predicts a 9th place finish for the Pilots. As you'll recall, another group that is picking UP to finish last is the WCC Presidents Council...they are the ones who determined GU would not have to play UP in Spokane and SMC would not have to play UP in Portland as a means of protecting the RPIs of those two schools. A good team will make a unified and positive response to being dissed, and a good coach will use the dissing as a motivator. How will Terry and the Pilots react? The Portland Pilots, in particular, will be heavily reliant on their sophomore class, many of whom had productive seasons in the team’s ninth-place effort. In fact, they have the most players in the Top 10 and Honorable Mentions, with four members of their roster named. Before we get into the Top 10 Sophomores, let’s consider five players that just missed the cut. Now, let’s take a look at the Top 10 Sophomores for the 2018-19 WCC Season. With such a young squad returning from the 2017-18 season, it should be no surprise that the Portland Pilots have multiple players on this list of top sophomores. One such player is 6’9” forward Tahirou Diabate, who leads all returners on the team in two-point field goal percentage and rebounding. Since the Pilots’ longtime anchor Philipp Hartwich has graduated, they will need another player to fill the void in the paint. While Diabate is not quite as tall as Hartwich is ability and effort as a big should allow him to take a bigger role on the team this season. The biggest positive to come out of Portland’s ninth-place finish in WCC play was the promise shown by its young core, specifically that of then-freshman guard Marcus Shaver. While three-point shooting was a struggle for Shaver, his ability to finish at the rim and his success from the stripe more than made up for his 26.6% shooting from deep. If Portland wants to truly compete in the middle of the conference next season, their jump with start with Shaver’s ability to take control of games. Not only will he have to score at a high rate, he may need to be more ball dominant and look to use his success as a means to catalyze the rest of his teammates. Josh and Franklin made this guy's honorable mention for top 10 juniors last week. Any top-10 list is obviously pretty subjective, but except for a couple of exceptions, the top sophomore and junior lists look pretty reasonable to me. The only change I would make is to move Josh McSwiggan from honorable mention to #8, and add Crisshawn Clark at #10 on the junior list. Josh should have a much-improved season on offense as he will no longer have to rely on always shooting from the outside now that the Pilots will have post players who can stretch the defense, allowing him to go inside to the basket. And Crisshawn has shown in offseason workouts to be very much a natural and vocal leader. He has a great attitude and has the potential to be the real star of the team this coming season if he can remain healthy after missing 3 seasons due to knee injuries. There remain reasons for optimism, Crisshawn Clark among them, Akwuba too, regardless of who is doing the ratings. Thanks for the update on Crisshawn's efforts. "Portland Basketball isn’t expected to accomplish much in WCC Basketball this upcoming season. Underestimating them could be fatal for opponents in 2019-20."